We’d love your help. Let us know what’s wrong with this preview of The Case of the Baker Street Irregular by Robert Newman. To ask other readers questions about The Case of the Baker Street Irregular, please sign up. Sherlock Holmes is basically a literary superhero to me. Sure his weaknesses are a little more interesting than most but he holds the same appeal to me as comic books do to fanboys. (or girls!) I am just one huge grin at all of the quick conversations, random factoids and asides, and during the eventual wrap-up when the billions of threads get sewn up tightly in a way that only Sherlock Holmes would ever be able to figure. A Goodreads friend sent me a copy of this book because she knows how much Sherlock Holmes is basically a literary superhero to me. Sure his weaknesses are a little more interesting than most but he holds the same appeal to me as comic books do to fanboys. (or girls!) I am just one huge grin at all of the quick conversations, random factoids and asides, and during the eventual wrap-up when the billions of threads get sewn up tightly in a way that only Sherlock Holmes would ever be able to figure. A Goodreads friend sent me a copy of this book because she knows how much I love Sherlock and I’d never read any of the more juvenile stories. How well could the dynamic duo translate to a younger audience? The answer to that question, at least in terms of this book, is two-pronged. Robert Newman was absolutely successful in creating believable dialogue and multiple interwoven mysteries involving a few younger characters. However, I’m still not sure how large of an audience would enjoy a younger-YA/middle grade Victorian multi-layered mystery. My heart hopes that there are quite a few precocious mystery-lovers out there. As an adult, I flew through The Case of the Baker Street Irregular in an hour or two and I’m not at all ashamed to say that I was legitimately surprised at some of the connections. Some other reviews have mentioned the transparency of the mystery but I found it to be entertaining til the last and honestly, I thought it better done than many adult murder mysteries I’ve read in the past. read 5 times. . .
Just finished reading this again. Still one of my fave books of all time. This is probably reaching being read 10 times. Enough Sherlock to have me on the edge of my seat. but satisfied with a quick read. A fantastic series that I loved as a kid and still holds up for adults. Well-written, engrossing mysteries with engaging characters and just enough of Sherlock himself to whet the appetite for investigation and adventure. Andrew’s always wondered about his parents. They’ve both been a mystery to him – his father dead, his mother absent. And now that Aunt Agnes is dead, it seems that he’ll never discover the secret of his parentage. He’s just arrived in London with Mr. Dennison, his tutor and guardian. The two of them have never been close, but when Andrew sees Mr. Dennison being forced into a cab driven by a mysterious broken-nosed man, he’s alarmed. His alarm turns to fright the next night when that very same cab Andrew’s always wondered about his parents. They’ve both been a mystery to him – his father dead, his mother absent. And now that Aunt Agnes is dead, it seems that he’ll never discover the secret of his parentage. Why is this man determined to catch Andrew? What is the purpose of the mysterious bombings occurring in London? And can Mr. Holmes solve both of these mysteries in time to save Mr. Dennison? I’ve read at least five pieces of imitation Sherlock Holmes fiction. These were written with varying degrees of stylistic accuracy ranging from exceptional to outright horrid. The Case of the Baker Street Irregular is not quite as simple to classify. To begin with, Holmes and Watson are not themselves the main characters - Andrew and his friends, Screamer and Sam (members of Holmes’ band of Irregulars), function in that role. Holmes and Watson follow as close seconds and, in that position, do not receive the same amount of attention that Doyle gave them, and are not the fully developed characters of canon Holmes. However, the book was saved by the fact that I could hear Basil Rathbone’s voice ringing through the clipped dialogue of Holmes. Newman may not have created the original, more philosophical Holmes of Doyle’s works, but he (purposefully or accidentally, I know not which) conjured up good old Rathbone to the pages. Oh, and one last quirky positive for me – Andrew comes from a small city which he describes as being ‘near Penzance’. On the last page, Watson regales Holmes with the song “A Policeman’s Lot Is Not a Happy One” from the Gilbert & Sullivan musical ‘The Pirates of Penzance’. HOW FUN IS THAT?!? Conclusion. A fun read for detective-oriented children or committed Holmes fans. This was a book that I had read when I was much younger and was glad to find that I enjoyed it just as much as an adult. I know I understood it a lot better having recently read the Origanal Holmes stories by Doyle. I think that the adventures of a young man named Andrew Craigie ties in really well with the case that Holmes is working on and those of you who read it solely for the Holmes element won't be disappointed. References to Doyle occur frequently in the conversations between Holmes and W This was a book that I had read when I was much younger and was glad to find that I enjoyed it just as much as an adult. I know I understood it a lot better having recently read the Origanal Holmes stories by Doyle. I think that the adventures of a young man named Andrew Craigie ties in really well with the case that Holmes is working on and those of you who read it solely for the Holmes element won't be disappointed. References to Doyle occur frequently in the conversations between Holmes and Watson. Though speaking from experiance when A kid reads this all they really care about is what's happening to the children. Best Sherlock Holmes I have ever read aside from the originals. I loved how amazingly rich the case was , it was a refreshing Delightful Read. A quick read that includes the famous Baker Street detective Sherlock Holmes. The Case of the Baker Street Irregular is a book that is painfully middle grade. What do I mean by that without being overly critical. Yes, laugh all you want that I'm worried about being overly critical. But I did enjoy the book, it's just that the author has some issues that are common in older books written for a younger audience (cough, L. Frank Baum, cough.) Primarily he talks down to his audience. He dumbs things down to make his audience get the concepts, but to a painful degree. The book is peppered with that dreaded concept of "teaching moments." He seems more concerned with educating his readers than creating a thrilling story that just happens to educate. This lends an overall flatness to the book. There is no fluctuation with excitement or danger or even mystery. The book plods along with it's slow snail pace and it's not until you accustom yourself to this that you can enjoy the book for what it is, not what it isn't. Newman is obsessed with locations and maps and characters muddling along through the morass of London in a way that does more to confuse than aid the reader. It isn't until Holmes in disguise is working with Andrew that the book finds it's legs. Before this moment it's two stories running tangentially that you are just waiting to connect. The book is also clever in that their working together isn't spelled out for you till the end. You know what's going on, but you're not 100% sure, and this is truly the only mystery the book affords that is worth your time. NOT my first time reading it- found it first in 4th grade and it MAY be part of why I was so willing to go into the Holmes rabbit hole. I recall loving the rest of the series as well (though no more Holmes and a new family situation that was set up in the first book) and I took the chance to reread. 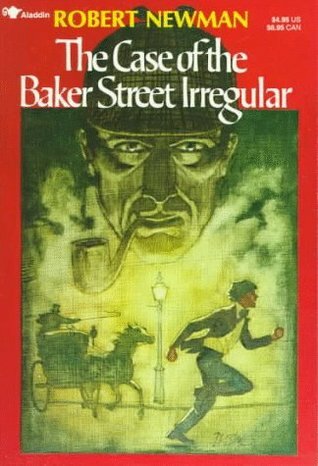 The Case of the Baker Street Irregular (1978) by Robert Newman is the first in a series of books featuring Andrew Craigie (later Tillet...as explained by the events in this novel), the Baker Street Irregulars, and, in various amounts, Sherlock Holmes himself. Andrew Craigie's life has been a mysterious one. He has grown up under the care of his Aunt Agnes. He had always been told that his father was dead and his mother was far away--and even though she couldn't be with him that she loved him ver The Case of the Baker Street Irregular (1978) by Robert Newman is the first in a series of books featuring Andrew Craigie (later Tillet...as explained by the events in this novel), the Baker Street Irregulars, and, in various amounts, Sherlock Holmes himself. Andrew Craigie's life has been a mysterious one. He has grown up under the care of his Aunt Agnes. He had always been told that his father was dead and his mother was far away--and even though she couldn't be with him that she loved him very much. But when Aunt Agnes dies and Andrew is taken in by his tutor, Mr. Dennison, Andrew begins to dwell on the questions that have haunted him: Who was his father and is he really dead? Where is his mother? If she really does love him, why didn't she come for him when Aunt Agnes died? And if she couldn't why didn't she at least write? Before Andrew can spend much time thinking about this, his new guardian takes him London "on business." Mr. Dennison is aloof--promising visits to the zoo, Madame Toussauds, and other places of note--but taking off directly after meals. Andrew is given leave to explore on his own and makes friends with Sara "Screamer" Wiggins (sister to Sam Wiggins who is one of Mr. Sherlock Holmes's famous Baker Street Irregulars). When Andrew returns from one of their outings one evening, he observes Mr. Dennison walking towards their lodgings ahead of him. Just before the man can enter the lodging house, he is accosted by a man in a growler and the cab's driver. It seems to Andrew that Dennison is reluctant to get into the cab and as it passes him he notices that the cabby, a heavset man with a broken nose, is grinning. Mrs. Gurney, owner of the lodging house, convinces him to wait to report anything. After all, gentlemen who come up to London sometimes meet up with unexpected people and perhaps Mr. Dennison wasn't so much reluctant as surprised to see the men. But by the next afternoon Dennison still hasn't returned, a visit to the local police station is unsuccessful, and Andrew is chased, robbed, and left injured. Fortunately, the Wiggins siblings find him and take him in. Meanwhile, Mr. Holmes is investigating some mysterious incidents involving the death of Lord Lowther and the theft of certain paintings left in his legacy to his son Adam as well as a rash of bombings in the city. It isn't long before Andrew's hunt for his missing guardian and the Great Detective's search for the paintings lead to the same place. Andrew, with the help of Screamer, will brave some of the worst sections in London before finding Mr. Denison....and, incidentally, the answers to some of his earlier questions. Andrew may wind up with a parent after all. This is a very promising debut in what looks to be an interesting children's/young adult mystery series. As much as I enjoy Holmes stories, it was refreshing to see this told primarily from the viewpoint of Andrew and the Irregulars. I've often thought books based on the Irregulars' adventures with Holmes (told from their viewpoint) would make for good stories. Andrew is given an interesting background and, while there is some coincidence at play here, I thought things worked out for him in a fairly plausible way. It is also intriguing that this children's mystery has a fairly adult plot--this is no "secret of the missing jewels." There is major danger and the kids just barely prevent a man from being shot before their eyes. Lots of adventure and intrigue and much to like in this first book of the series. ★★★ and a half (rounded up here). This review has been hidden because it contains spoilers. To view it, click here. The first of the series of books about young detective Andrew Craigie (although I haven't been reading them in order). I was surprised to see that the book had been written in the eighties, as it has such an old-fashioned feel to it. The story is set in the early 1900s, and is an homage to the great detective stories of that era, albeit in much simpler language. And yet the terms and descriptions are such that the reader is totally immersed in the world. This is also part fan-fiction as it featu The first of the series of books about young detective Andrew Craigie (although I haven't been reading them in order). I was surprised to see that the book had been written in the eighties, as it has such an old-fashioned feel to it. The story is set in the early 1900s, and is an homage to the great detective stories of that era, albeit in much simpler language. And yet the terms and descriptions are such that the reader is totally immersed in the world. This is also part fan-fiction as it features Holmes and Watson, but it is splendidly done. The characters are well developed and the storyline is gripping. This book was so slow that I was tempted to put it down. I only kept at it because it was pretty short. I know this is supposed to focus more on the boy, Andrew, but the early on parts where we got glimpses of Sherlock and actual scenes with him were very boring and dull. He lacked the spark that makes him unique. But, about half way through when we were introduced to Ben the blind man, the book picked way up. It's obvious who it is, and I was on alert for any sort of clue as to what he was up to This book was so slow that I was tempted to put it down. I only kept at it because it was pretty short. I know this is supposed to focus more on the boy, Andrew, but the early on parts where we got glimpses of Sherlock and actual scenes with him were very boring and dull. He lacked the spark that makes him unique. But, about half way through when we were introduced to Ben the blind man, the book picked way up. It's obvious who it is, and I was on alert for any sort of clue as to what he was up to, and it really saved the book. I hated Screamer. I knew that her only point in the story would be to add a little bit of romance, which fell flat, and that somehow her voice would be used to save the day. Very disappointed to be right. This story was exactly what I wanted it to be: a fun mystery for YA. It tells the story of Andrew, a boy who doesn't know who his parents are and is living with a guardian. They travel to London where his guardian is kidnapped. Andrew finds Sherlock Holmes, who helps him to find not only his guardian but also to find out about his past. It was a fun and quick read. I remember reading this book when I was about 10 or 11 and was just getting into Sherlock Holmes (by A.C. Doyle). I had read some other authors who had written some Holmes stories and was unimpressed, but this one I really liked. I thought the Holmes in this one was true to form and it was neat to see a story from the point of view of a character other than Watson. I read this one to my children. It reminded me of the books that I read as a child. There was enough of a story to keep the younger ones interested, and enough of a mystery to keep the older ones engaged. I think it was best for my 9 year old. Plus, several of my kids are interested in reading Sherlock Holmes now. This was a great book! Not great in the sense of a classic, but great in the sense that it kept you wondering: Who is this kid? Why is someone chasing him? Why has his guardian disappeared? Are his new friends really friends? There should be more books like this! It's the source of the reference for the army of children in my favorite book. Well, maybe not this book specifically, but the Baker Street Irregulars in general. I read this book when I was a kid. I really liked the series. I was glad when I saw it on the kindle. Now I can share it with the young teens of this age. My mom read this out loud to me and my brother when we were little. One of the best "thriller/suspense" books for a younger age group. Read this aloud to my 9yo. Some parts were boring to him and over his head but he enjoyed the chapters featuring Andrew & Screamer. This book was one of my favorites way back when. Maybe it's the nostalgia talking, but I still like it now. Thank heavens cynicism hasn't ruined everything for me. From 1973 to 1988, he wrote books for y Librarian Note: There is more than one author in the Goodreads database with this name.